This week, we kicked off Fairmont's "Great Outdoors" themed summer programs with Week One of Summer Camp. 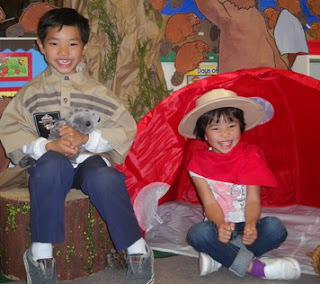 The theme this week was: Welcome Wilderness Explorers! We're already having a blast with our awesome new campers--summer is off to a wonderful start! Today, we wrapped up week one with the Camp Kick-Off Pow-Wow at the Anaheim Hills Campus. Campers enjoyed waterslides, cotton candy (nachos, pizza, snowcones and more... sorry mom! ), beading and build-a-bear stations--along with games and other activities all designed to help us welcome a summer of fun with friends! It's not too late to sign up for summer school, which starts on Monday, June 27th. We're looking forward to a summer packed with adventure here at Fairmont! 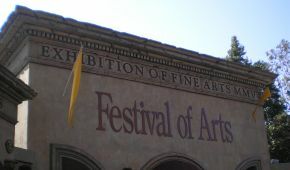 The Laguna Beach Festival of Arts is famous for its summer showcase and its spectacular Pageant of the Masters. A visit to the festival is a great way to spend a day with the family this summer! Happy Scarecrow by 2nd Grader Christine C.
My Cute Panda by 2nd Grader Natalie B. Still Life by 4th Grader Tiffany K.
Chinese Village by 4th Grader Daryuish K.
The Festival of Arts runs from July 7-August 31 and is located at 650 Laguna Canyon Road in Laguna Beach. On Thursday afternoon, our 2011 Kindergarten Class and all their friends and family made their way to the Fairmont Preparatory Academy for the promotion ceremony. Mr. Jackson, Citron Parent Board President Candice Tupajic and Mrs. Douglas addressed the crowd and wished the graduating class a bright future in the first grade. After the graduates serenaded the audience with an adorable "Graduation Song," each student crossed the stage and received his or her diploma. The event concluded with a slide show from the year. We are so proud of our kindergarten graduates, and we know you will go on to accomplish great things. We will miss you! Room One surprised their parents with this special poem inspired by Dr. Suess' "Oh the Places You'll Go!" We hope you enjoy watching! It's summertime and that's something to celebrate! And what says celebration more than a sweet treat like these delectable Nutella & Banana Crepes?? 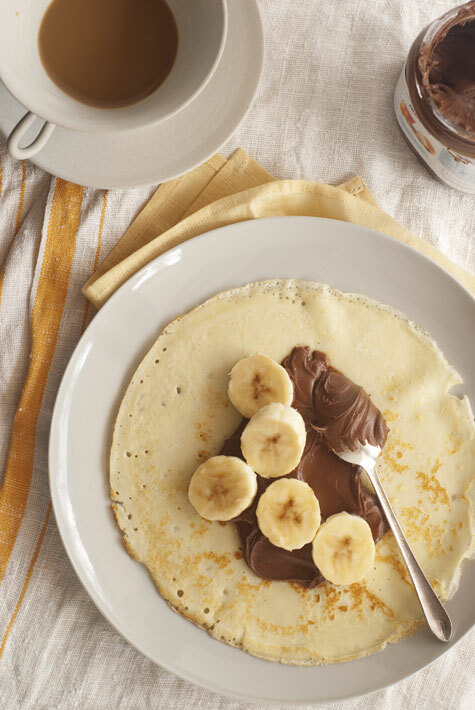 This great, simple recipe is courtesy of Catherine Taret, and it's guaranteed to make your kids smile. On Thursday, June 2, the Junior High Theatre class performed in two showings of their final play for the school year, entitled Café. Café is a collection of scenes and monologues dealing with the triumphs and tribulations of junior high life. The show was set in an outdoor Café, and narrated by Mr. Bean, the café owner. Scenes covered a variety of timely and important topics, from dealing with academic and social pressure, to facing embarrassing situations and talking to parents, and to the difficulty of making friends and understanding one another. The cast wowed audiences with their honest portrayals and bold choices. They displayed amazing talents, not only in acting and character development, but in their ensemble work, as well as dancing and singing. The students worked hard and it showed! 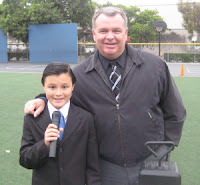 On Tuesday, June 7, parents and teachers were invited to the annual 5th grade State Fair. Students from our fifth grade classes created model representations of the states on which they wrote their reports. Each state was uniquely created by each student using various methods to construct the models. Some methods included papier mache, clay, cakes, jello, and rice krispies. The models were beautifully displayed and shared in the cafeteria for all to see. Nathalie Song painted New Hampshire on canvas, and Rick Yun used chopsticks as his medium to represent Montana. Samantha Tan and Kayla Shikina made their models look "sweet." These were just a few of the wonderful and creative models. All of the fifth graders worked really hard, and their models turned out fantastic. We would like to thank our parents, teachers, and satff for their support. 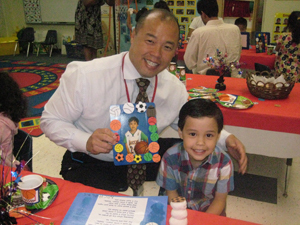 The Mable Parent Association held its last meeting of the year on Thursday, June 9. After a very successful year, some board members said good bye as newly chosen ones were announced. Mrs. Kishimoto submitted the poem below after the meeting. "Let's do it this way, it's more fun!" "Oh, we're just glad to do our part." "Walk with us, we'll show you the way." "Goodness no, we don't want pay." "You can do it, we'll show you how." "You need it when? We'll do it now." "If you need anything we're right here." "Who are we? We're Mable Campus Volunteers." We thank all of our parents for their support to the Parent Association. I find it unbelievable that it is the end of another school year. It has been a pleasure serving as your Director and I look forward to the 2011/12 school year as we continue our journey together. I wish all of our students transferring to other campuses and schools all the success and happiness in the world. Each year the students and staff bond as a family and it is sad to see them leave. 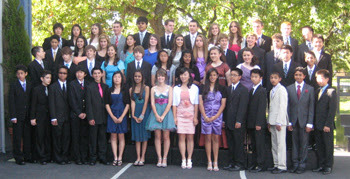 We are proud of what they have learned this year and always relish the opportunity to celebrate their accomplishments. We have had parents who have spent endless time and energy in support of the students and the school. We thank them from the bottom of our hearts. We have teachers and staff whose commitment has gone beyond the bounds of what is expected and to them goes a debt of gratitude. Finally I wish everyone a very happy and relaxing summer. Enjoy the vacation with your families and those travelling overseas, have a safe trip and a speedy return. I am looking forward to seeing all those students enrolled in summer school and camp. We are going to have a good time. Students joined together in a campus spirit event to support the Red Cross of America on Wednesday, June 8th. All students participated in an obstacle course event that entailed jumping over hurdles, going down the slide, and walking across a balance beam. Our campus raised $1,500 in donations for the Red Cross! We are so thankful for our Fairmont family and friends who supported the students and this worthy cause. Kindergarten students will travel to the Fairmont Prep Campus for rehearsal on June 15th. Students will depart at 1:00pm and return at 2:30pm. Kindergarten graduation will be Thursday, June 16th at 2:00pm. It will be held at the Fairmont Prep located at 2200 W. Sequoia Ave, Anaheim. June 16th will be a regular morning for kindergarten students. School will begin at 8:25am and they will have lunch at 11:30am. The kindergarteners will leave Citron on the bus at 1:00pm. Parents must pick up their child after the graduation ceremony at the Prep. Parents are required to sign-out their graduate with their teacher before they leave the Prep. This is not a free dress day. Boys must wear their white polo shirts and navy blue pants. Girls must wear their white blouse with jumper. Cap and gowns will be kept on campus and placed on the students once they arrive at the Prep. Please do not arrive to the Prep before 1:00pm. Many high school students are still testing. You will not be allowed in the gym before this time. Tickets are not required for the ceremony however space is limited and we ask that guest be limited to 6 per graduate. Seating will be on a first come first serve basis. It’s never too early to order your husky gear for next year. Order forms are located in the Citron lobby and items will be available for purchase at a discounted price if ordered by June 17th. Items available are shown below. 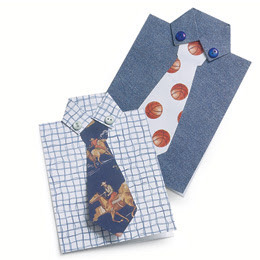 Father's day is just around the corner, and while Dad may not always be into arts & crafts, no Dad can deny how much a handmade gift means to him. Here are some fun gift ideas from Disney Family Fun that are perfect for papa. We'd love to hear your craft ideas too! What Dad doesn't want to be King for the Day? 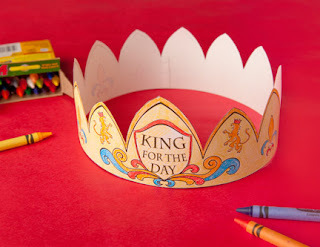 Print and color this crown with your Dad's favorite colors and deliver it to him along with a homemade breakfast. 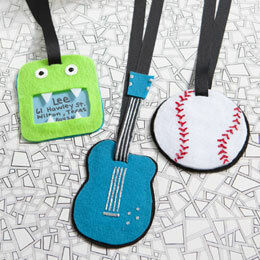 For the Dad that's always on the go, these fun luggage tags are the perfect gift. "Harry Potter Hogwarts School of Witchcraft and Wizardry"
The old saying goes: "one person's trash is another person's treasure." Well, the annual Trash Artisit Challenge says trash can not only be treasure, but art!! On June 8, 2011 at the Anaheim Hilton, Fairmont students Jyothii K., Bryan D., and Justin C. were invited to attend the Trash Artist Challenge awards, celebration and dinner. 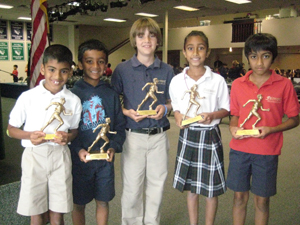 Our two sixth grade teams were finalists in this year's competition. "Come Alive-the story of Little Red Riding Hood"
Bryan and Justin along with many students from Mrs. Cameron’s 6th grade class created the Harry Potter’s Hogwarts school. Jyothii created “Come Alive”--the story of Little Red Riding Hood in 3-D. All materials were recycled.